Most commonly spoke language. This interesting map comes from Ben Blatt of Slate, who used data from the Census Bureau’s American Community Survey. He. 1 Most commonly spoke language. This interesting map comes from Ben Blatt of Slate, who used data from the Census Bureau’s American Community Survey. 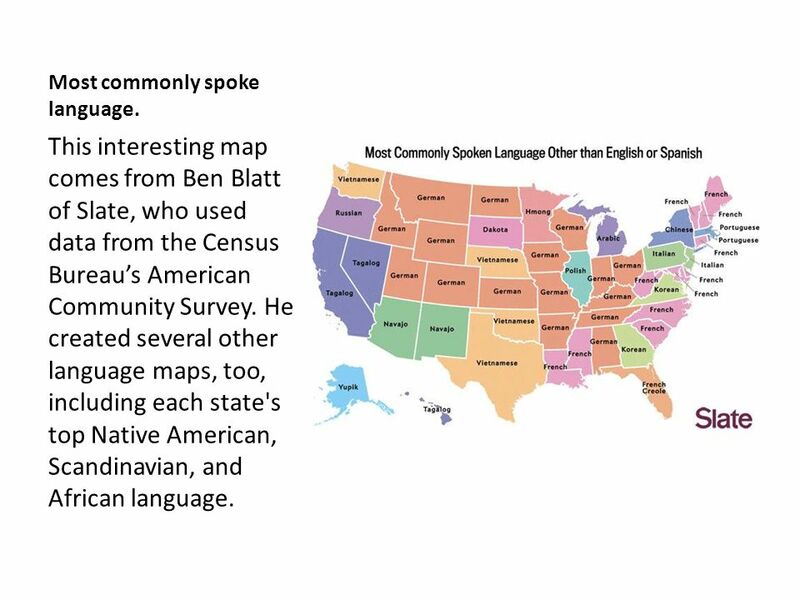 He created several other language maps, too, including each state's top Native American, Scandinavian, and African language. 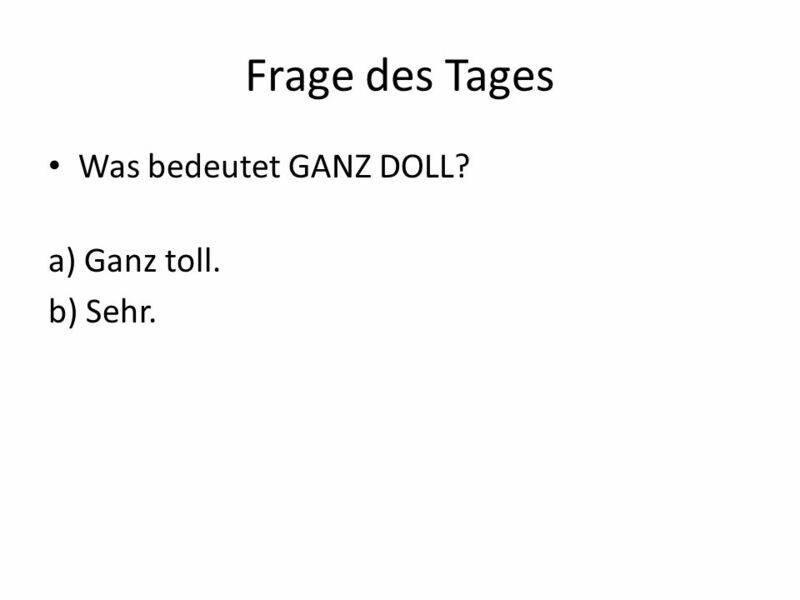 2 Frage des Tages Was bedeutet GANZ DOLL? a) Ganz toll. 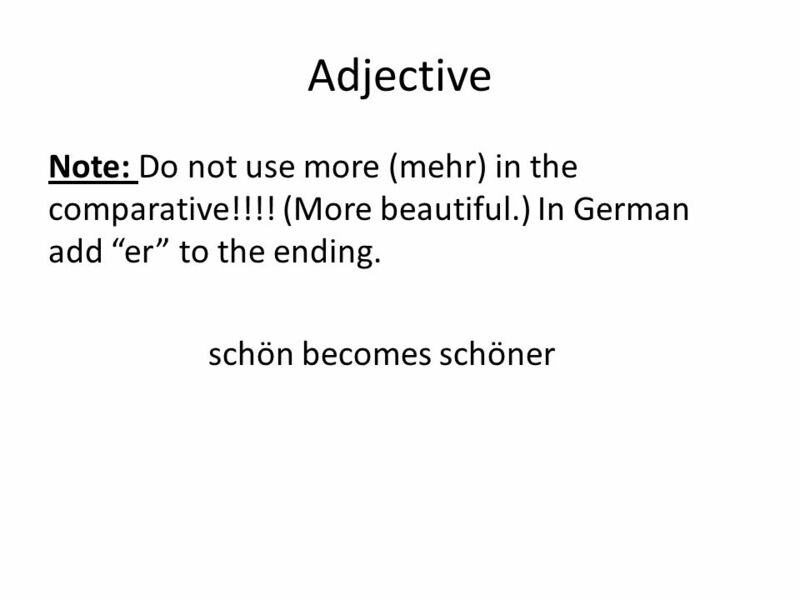 b) Sehr. 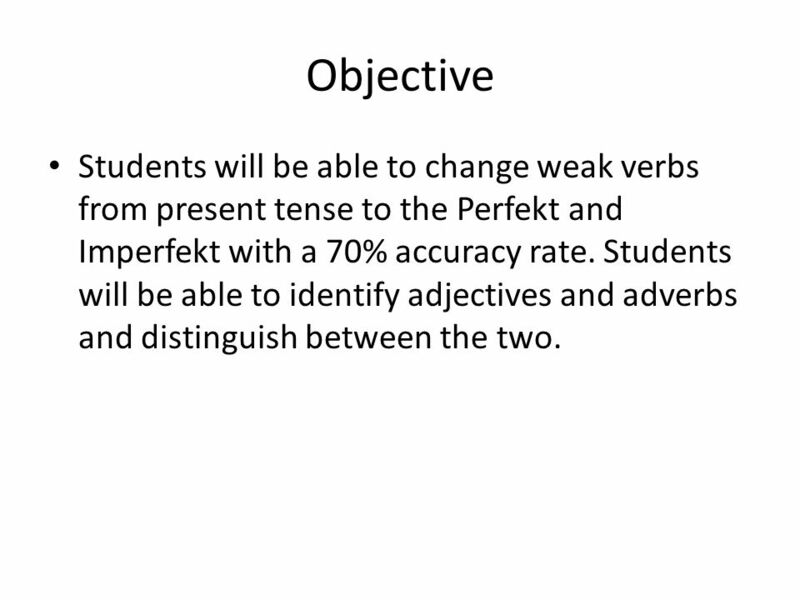 3 Objective Students will be able to change weak verbs from present tense to the Perfekt and Imperfekt with a 70% accuracy rate. 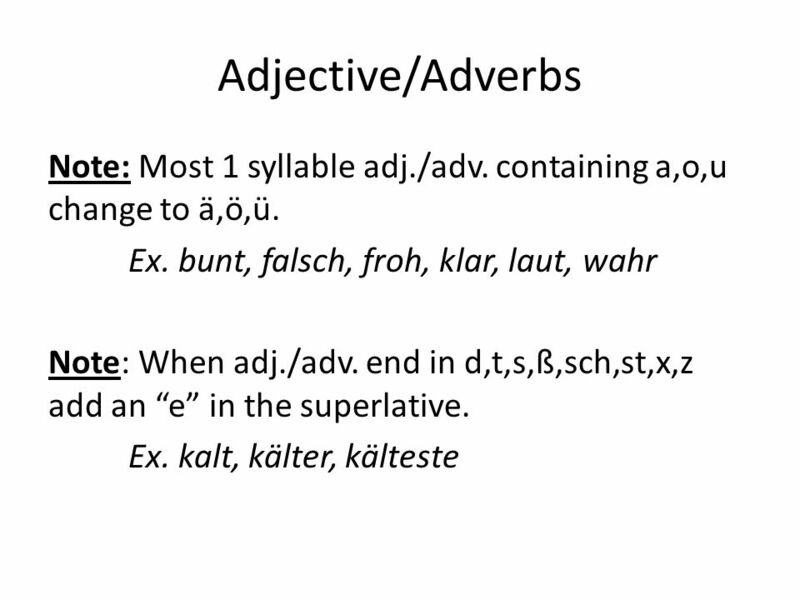 Students will be able to identify adjectives and adverbs and distinguish between the two. 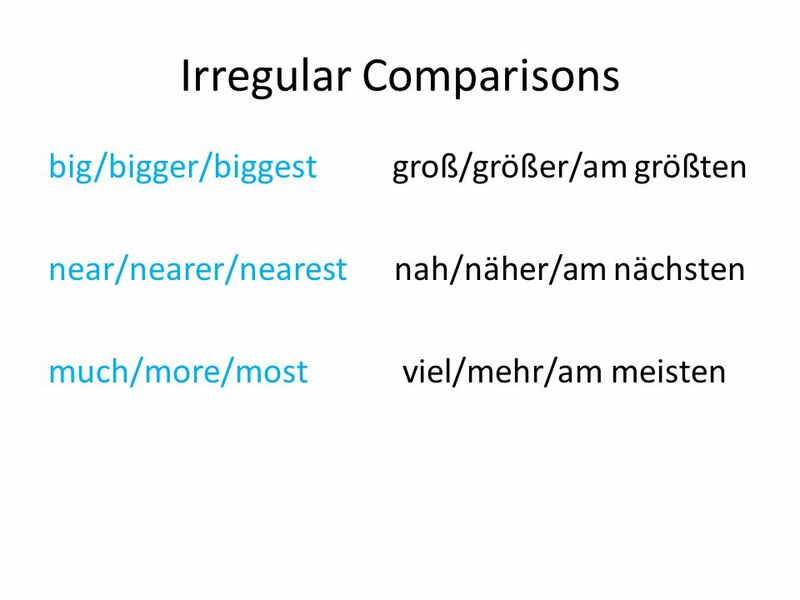 4 Comparison of Adjectives/Adverbs An adjective modifies a noun. 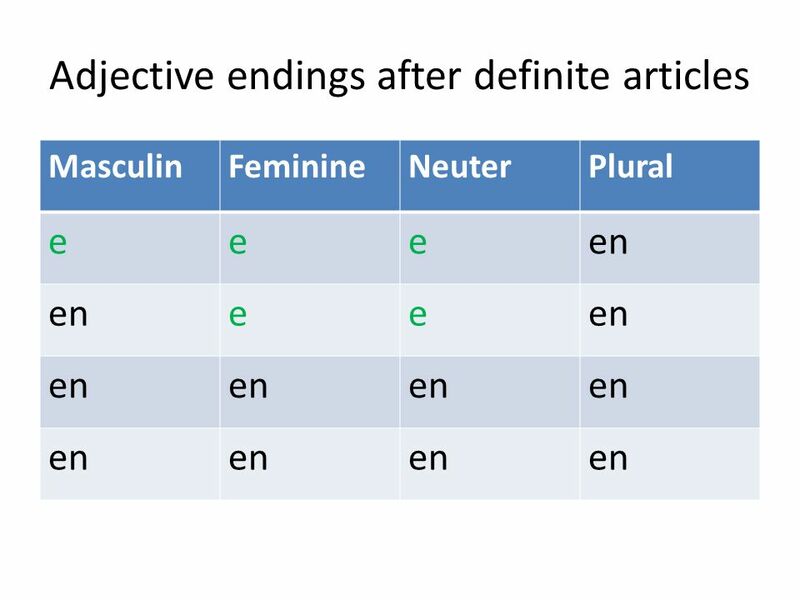 An adverb modifies a verb. 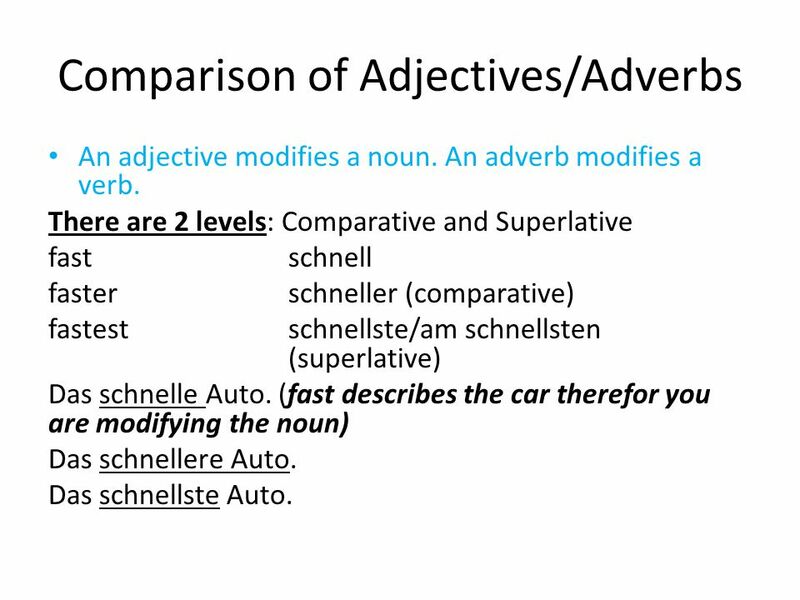 There are 2 levels: Comparative and Superlative fastschnell fasterschneller (comparative) fastestschnellste/am schnellsten (superlative) Das schnelle Auto. 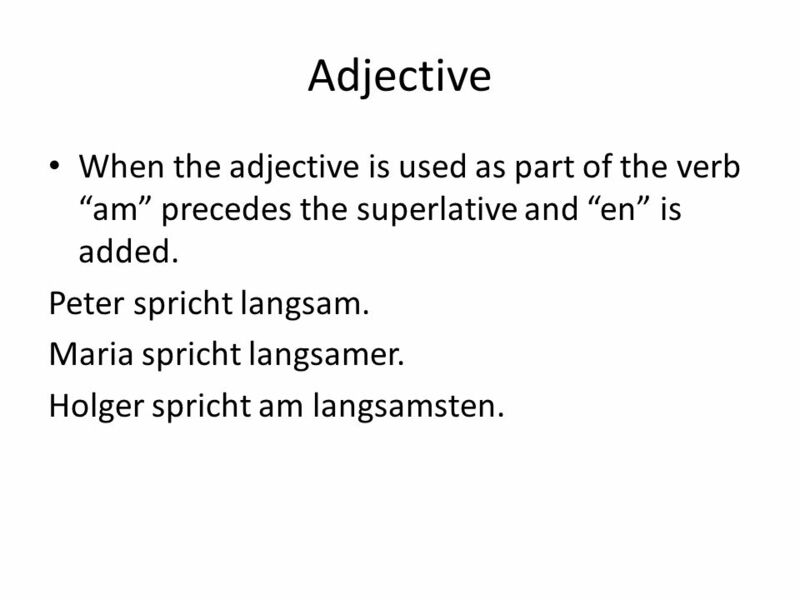 (fast describes the car therefor you are modifying the noun) Das schnellere Auto. Das schnellste Auto. 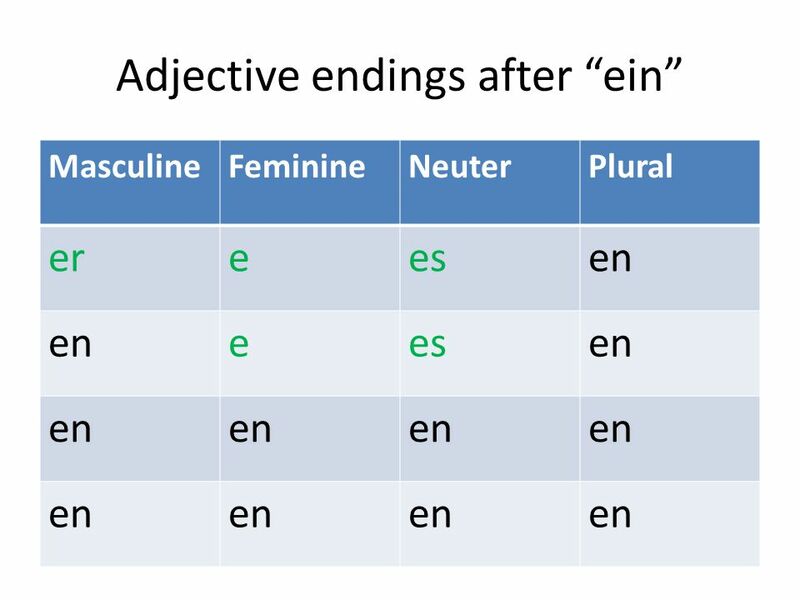 5 Adjective When the adjective is used as part of the verb “am” precedes the superlative and “en” is added. Peter spricht langsam. Maria spricht langsamer. Holger spricht am langsamsten. 8 Adverbs Die Straßenbahn fährt schnell. – The streetcar travels fast. Das Auto fährt schneller. - The car travels faster. Der Zug fährt am schnellsten. – The train travels the fastest. 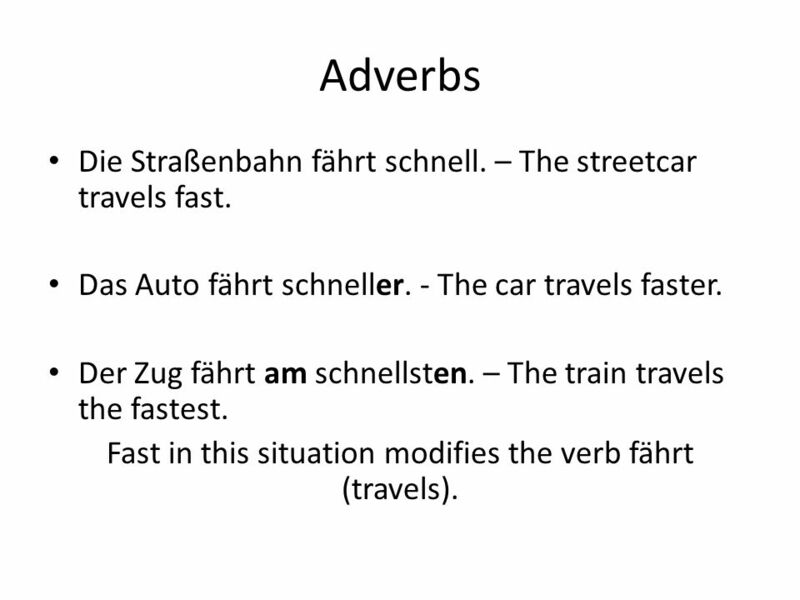 Fast in this situation modifies the verb fährt (travels). 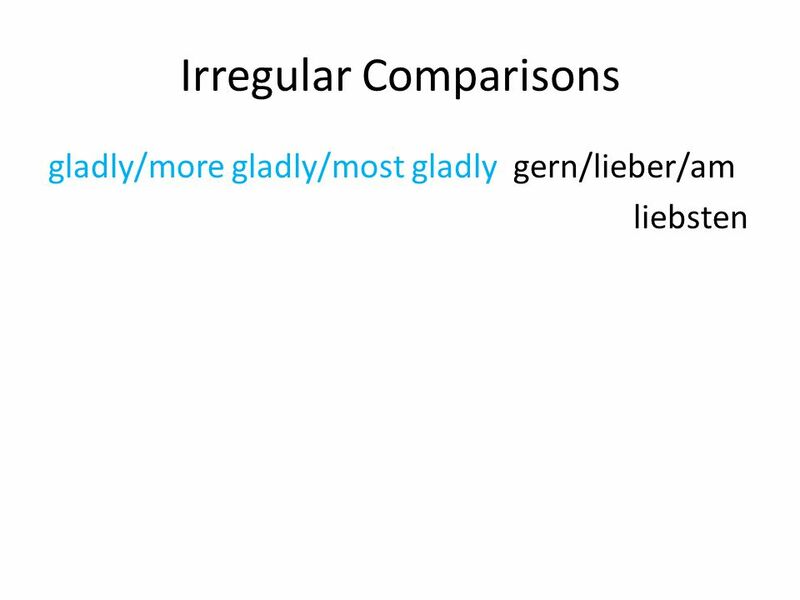 Herunterladen ppt "Most commonly spoke language. This interesting map comes from Ben Blatt of Slate, who used data from the Census Bureau’s American Community Survey. He." 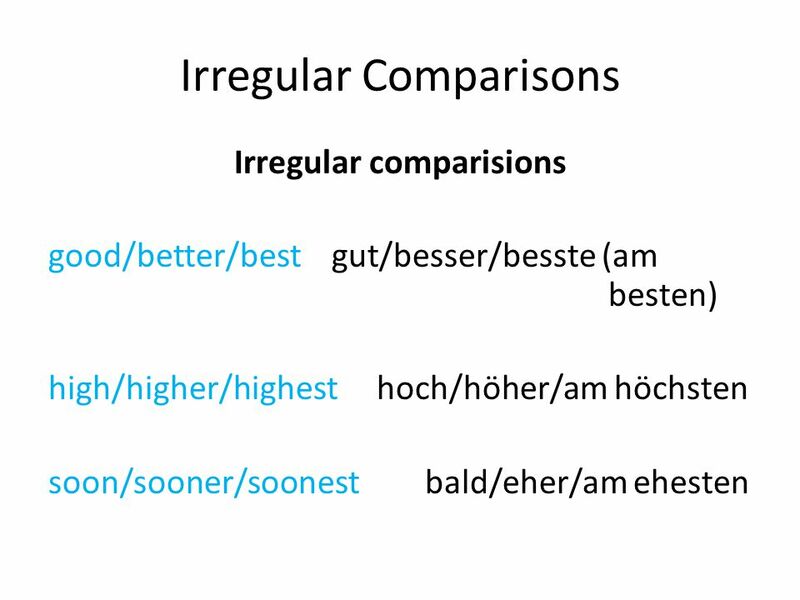 Making Comparisons Personal Id./Descriptions Unit Deutsch Aktuell 2. Ich bin mit dem Bus gefahren, aber warum?